Aquarium plants come in all shapes and sizes, so it can be difficult to know which one is right for you. If you want a carpet species there are a few options available for home aquariums. One of these is dwarf hairgrass. This species creates a field across the bottom of your tank with its grass-like appearance. In addition, it oxygenates the water, removes pollutants and acts as shelter to bottom-dwelling fish. Those who haven’t got much experience with aquatic plants shouldn’t have a problem with this species as it’s hardy and adaptable. 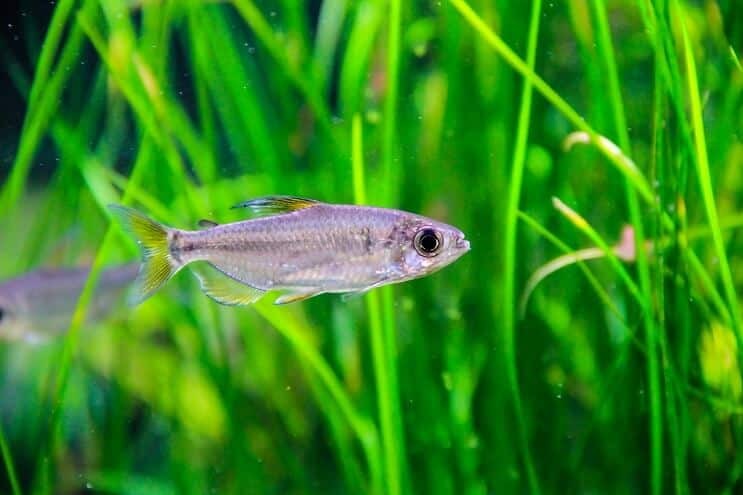 This article talks you through all you need to know about dwarf hairgrass, from appearance and tank conditions, to tank mates and propagation. There are two species of dwarf hairgrass, Eleocharis parvula and Eleocharis acicularis. It’s a freshwater plant from the Cyperaceae family. These species are widespread across the globe, ranging from North America to Europe, even stretching to Asia and South America. It can be found in shallow freshwaters with plenty of access to light. Most of the time dwarf hairgrass is used as a carpet, coating the bottom of the tank in a luscious green field. It’s a fast-growing plant so you can create this effect with just a small amount that will quickly multiply. This carpet provides shelter to bottom-dwelling fish (like pictus catfish), while oxygenating the tank and cleaning the water too. As an undemanding aquatic plant, it’s popular in the fishkeeping industry. It has very basic needs, requiring just light, nutrients and CO2. It is easy to maintain as well, so beginners can manage it without devoting too much time. The dwarf hairgrass have lots of different uses. First, it has several practical uses. It oxygenates the water, helps to control nitrate levels and remove pollutants. Dwarf hairgrass is a carpet species, so it provides some services that are only shared by other carpet species. The main use is as a shelter to bottom-dwelling fish. Other uses include being a food source and a shield from currents, not to mention its unique appearance. This plant’s name gives a good description of what it looks like. It has a simple grass-like appearance with strands/blades rather than leaves. Each strand is relatively thin like hair and is used for photosynthesis. The white roots are just as thin. Once planted you won’t see these much as they mainly stay in the substrate. It is termed as “dwarf” because it grows quite short compared to other closely related species. When fully grown, blades will reach 4-6 inches. This means they’re ideal as a carpet species. It is a popular choice for those who want to add color to the bottom of the tank. Dwarf hairgrass is suitable for paludariums too. Since the blades are so thin, they are densely packed. Not only does this make a more complete carpet to cover the bottom of your aquarium, but the tightly packed strands cause colors to intensify. These colors are light greens that become stunning when under aquarium lights. As the plant grows taller, the blades are gently pulled by the current flowing around the tank. This movement adds an interest and your fish will enjoy living in this dynamic environment. Both species look similar and it can be difficult to tell them apart. However, E. acicularis can develop curlier blades and grow slightly taller. The similarity between the two species can mean that they’re often mislabeled in stores, so be careful when buying (more on this later). The popularity of this plant keeps it in high demand, so you will be able to find it in most aquarium stores. It’s also cheap to buy. Prices vary depending on how much you buy, but $5-$10 should get you enough to start a carpet. Clumps are usually sold in small pots with wool around the roots. Don’t just buy the first clumps of dwarf hairgrass you see, picking a healthy plant gives them the best chance of survival when you add them to the tank. Brown colorations are the easiest way to spot unhealthy plants. Ideal specimens will have bright green blades. Also look for long roots as this will help them absorb nutrients. The plants as a whole should be able to support their own weight. Lastly, check for any signs of damage, such as tears or brown patches. An unhealthy plant will be less efficient at photosynthesizing and will struggle to acclimatize to a new environment. Though dwarf hairgrass is found across the globe, it tends to live in similar conditions wherever it’s found. The most important of which, are the shallow tropical freshwaters that have plenty of access to light. They are generally found in sandy or muddy areas along rivers or lakes. You can recreate these habitats at home easily, and as a hardy plant it can live healthily in a variety of setups. The first thing to consider is the size of your tank. 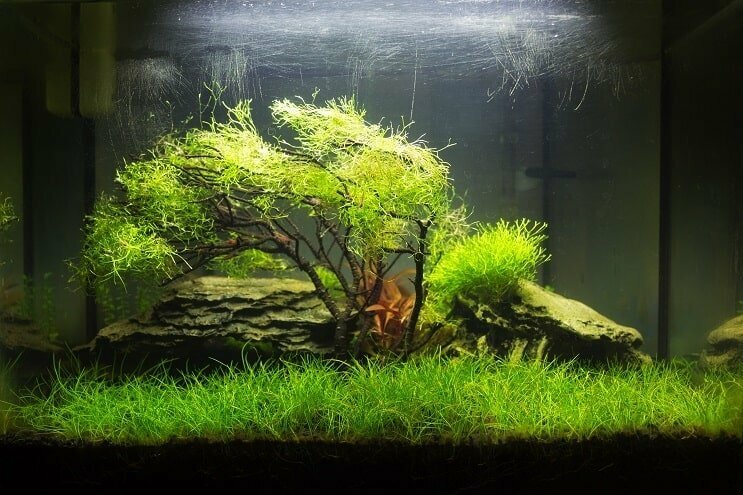 Being a small plant at the bottom of the tank, you can put hairgrass in tanks as smalls as 10 gallons. The aquarium should be coated in a layer of substrate, no more than 1.5 inches thick. Sands are ideal because the fine grains make it easy for the roots to push through. The water can be anywhere in a broad range of temperatures, from 50-83°F. This plant can survive in cool waters, one reason for its wide distribution. pH needs to stay fairly neutral (6.5-7.5), so avoid extremely acidic or alkaline waters. Soft to moderately hard water (2-10 KH) is best. Aquarium lighting is crucial for photosynthesis, and plant growth. Most commonly sold lights will be fine. You need to plant your dwarf hairgrass in a soft substrate so that the roots aren’t damaged by the grains. Once the substrate is sorted you need to decide where you want to place your plants. As a carpet species you can place this all over the bottom of the tank. Some people choose to fully cover the bottom of their tank with this plant, then trim the plants at the front shorter than those at the back. The idea planting place has plenty of light for photosynthesis. Unlike some plants, dwarf hairgrass can’t photosynthesize in shaded areas. When planting, bury the roots fully into the substrate and keep all the strands above the substrate. Dwarf hairgrass shouldn’t cause much trouble and is an easy plant to maintain. All you will need to do is trim the plant’s strands whenever they get too long for your liking. Its blades grow fast so you might have to do this more often that some other plants that you may be used to. Some people choose to let this plant grow longer at the back of the tank while keeping it short at this front. This gives mid-level fish somewhere to hide but doesn’t obstruct your view through the aquarium. If you don’t think your plants are growing at the rates they should be then something is probably limiting their growth. Check that they’re not planted in shaded areas where they can’t get access to light. If light isn’t the problem, then it could be a lack of CO2 or nutrients. You can get supplements for both of these from stores, just be careful of any effects they might have on your fish or algae growth. Hair algae can be a nuisance and it can gather over this plant. This indicates too much light and nutrients, or too little CO2. You may have to add some algae eaters to clear the algae up. This plant propagates quickly but it’s harder to manipulate the propagation process compared to other species, like water wisteria. With many aquarium plants you can speed up propagation by taking cuttings, and planting these elsewhere. This doesn’t work for dwarf hairgrass since any cuttings you take won’t be able to grow their own roots. As this plant grows, runners form and branch off the root area. These then develop into their own plant, growing from the roots up. It’s hard to manipulate this as you can’t create your own roots. Luckily this isn’t usually a problem because dwarf hairgrass grows so quickly. This means that runners are produced regularly and the carpet spreads over the whole tank in no time. If propagation isn’t happening as fast you’d like, then you can speed it up by making sure the plant has everything it needs for growth. 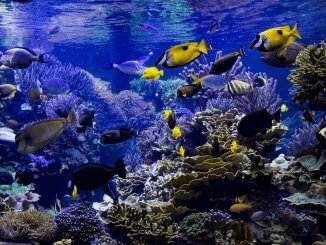 Ensure that the aquarium isn’t depleted of nutrients or CO2, and that there is plenty of access to light. Raising the temperature of the water, while staying within the acceptable range, should speed up growth rates too. There aren’t many compatibility problems with this plant. It can be housed with most other plants or tropical fish. If you are keeping other plants in your tank, then be careful that the density of dwarf hairgrass doesn’t get out of hand. A dense carpet will force plants to compete for resources. This is a fight that dwarf hairgrass does very well in, so you might see your other plants start to die off. Plants with broad leaves often get nibbled by fish but as this plant has long strands they are less likely to be eaten, though it may happen from time to time. You have a lot of choice when thinking about the fish you want in the tank. 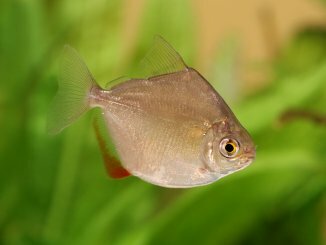 Small, peaceful fish are ideal, they’re less likely to cause damage. 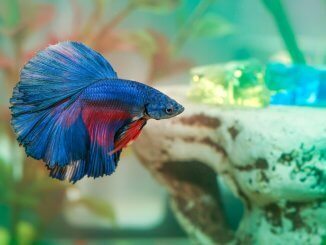 Danios, Guppies, Mollies, and Tetras are some good examples. Other similar fish should be fine too. Since this plant forms a carpet, it’s bottom-dwelling fish that will benefit most from having it around. Bumblebee Catfish, Clown Loaches, Corydoras Catfish, Khuli Loaches, Yoyo Loaches and Zebra Loaches will enjoy the extra shelter. Avoid large fish with a reputation for being boisterous. Oscars are a great example; they are known to uproot plants in their search for food. Snails tear through plants with ease, so might damage your hairgrass. Certain varieties (such as assassin snails) don’t tend to eat plants as much as most, so there are options if you have your heart set on snails. Shrimp are another popular invertebrate for aquariums and should have less of an effect on your plants, as long are they’re healthy. Most people should be able to look after dwarf hairgrass. It’s hardy and requires little maintenance beyond the occasional trimming. It can be kept in aquariums of all sizes, and it can be kept in a wide range of setups because it can adapt to a variety of conditions. This is a good choice for people of all experience levels. As a carpet, it adds color to the bottom of the tank while providing shelter for stressed fish. Your tank will be healthier with some dwarf hairgrass, the water will be oxygenated, and it will remove some of the pollutants before they can build up to toxic levels. This is one of the most popular carpet species and it’s not difficult to see why. Firemouth Cichlid Care Guide: Are You Ready For This Fiery Fish?